The origins of Hacienda Temozon began in the 17th century, when it was founded as a cattle hacienda. It reached its glorious splendor during the Belle Époque of the Yucatan with the sisal boom in the 19th century. After the introduction of nylon ropes, Temozon and all the haciendas in the region fell into shambles and were virtually overtaken by the jungle. A group of private investors envisioned Temozon as a stunning, unique, and authentic luxury hotel and carefully restored it to its former glory. 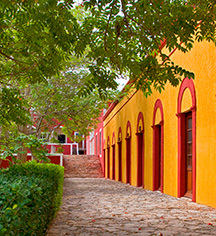 Using ancient Mayan techniques, the old quarters for the hacienda’s managers were transformed into extravagant guestrooms. Each guestroom reflects the luxuriant simplicity of hacienda living in the 19th century, with many antiques adorning public areas. The gardens are impeccably tended to showcase the impressive architecture. Contemporary details combine perfectly to complement the sense of history with a modern timelessness. 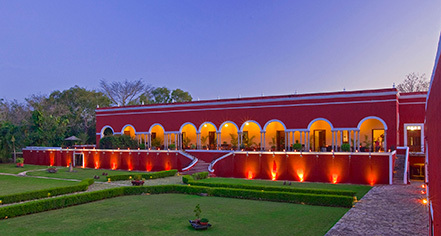 Hacienda Temozon, a member of Historic Hotels Worldwide since 2016, dates back to 1655.